BAMA GELSTEEL STRONG is a high viscosity product with pickling and passivating action on austenitic steel (300 series steel), martensitic steel (400 series steel) and austene-ferritic steel (duplex and superduplex alloys). BAMA GELSTEEL STRONG is particularly effective in removing any trace of welding oxidation. BAMA GELSTEEL STRONG can be applied to the surface to be treated by spray or brush. BAMA GELSTEEL STRONG does not remove any slag or welding lumps that can only be removed by mechanical action. The time that the product remains on the surface to be treated depends on the type of stainless steel, the operating temperature and the extent of oxidation on the surface. 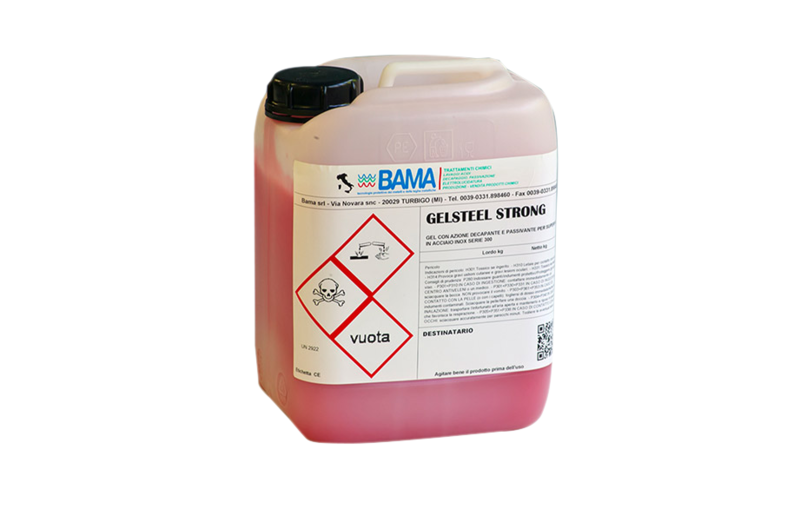 BAMA GELSTEEL STRONG Spray is available for sale in 5kg (sales code: GSST5), 10kg (sales code: GSST10), 25kg (sales code: GSST25) and 1000kg (sales code: GSSTcis1000) canisters. BAMA GELSTEEL STRONG Pasta is available for sale in buckets of 1kg, 3kg, 5kg. BAMA GELSTEEL STRONG should be stored in a place protected from frost and direct sunlight. The product must be stored in tanks specially supplied by BAMA and labelled in accordance with EEC regulations.